This morning I rode a Segway (Personal Transporter) along the promenade at Armon HaNatziv and I can report that it was really fun (as they say in Hebrew, היה כיף). The Segway is a two-wheeled, self-balancing electric vehicle that was invented by Dean Kamen in 2001. There are 5 gyroscopes that with the aid of computers and motors in the base keep the Segway upright and balanced. Users lean slightly forward to go forward, lean back to stop or go backward and turn using a handlebar that can be tilted left or right. Currently I often start a tour of the Old City or Herodium with an overview from the promenade so I’m happy to be able to add a Segway tour as part of a day’s guiding. Another example, before visiting the Knesset or Israel museum, you can ride through the Valley of the Cross, past a Crusader fortress-like monastery that was one of the first buildings outside of the Old City walls but in fact, goes all they way back to Queen Helena, the mother of the Emperor Constantine. It’s also possible to arrange a tour along the Jaffa-Tel Aviv promenade along the Mediterranean coast as part of a guided tour of Jaffa and/or Tel Aviv. 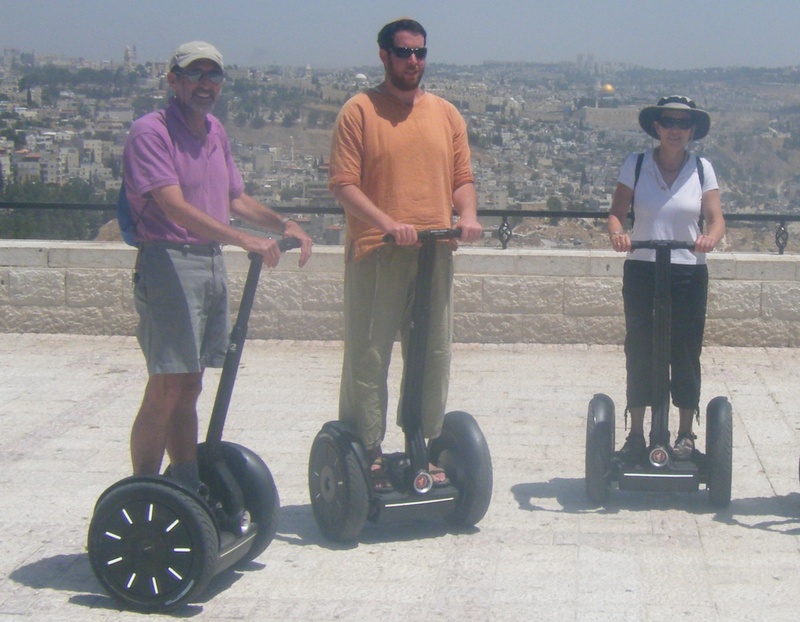 A Segway tour adds 180 NIS (which comes to less than $50.) per person (minimum of 2-3 people) for about 2 hours, note that children must be 16 years or older. Helmets and knee and elbow pads are provided. This entry was posted in Technology and tagged bike tour, Jerusalem, promenade, segway, segway tour, segway transporter, technology, Tel Aviv, Yarkon park, zoo on May 30, 2010 by Shmuel Browns.